As a young woman, Isabella expected that one day she would leave her home country of Castille for a strategic marriage. What she did not expect, particularly as she had two older brothers, was the series of events that would instead make her the Queen of Castille in her own right; the events that would cause her and her husband Fernando of Aragon to authorize the most famous of all Inquisitions, that would have them overtake Grenada from the Moors. Even for those who know the eventual outcome of Isabella’s story, C.W. 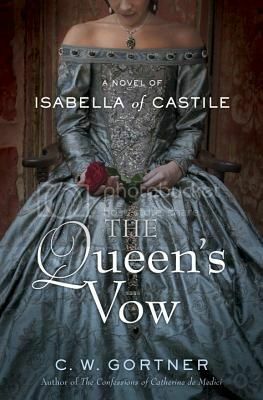 Gortner, in his new book The Queen’s Vow, takes his readers so deeply into Isabella’s head that we can almost not believe that she will some day be queen either. Gortner tells Isabella’s story from the time of her father’s desk and her eldest half-brother’s disastrous reign through the successful culmination of her reconquista against the Moors. I have found Gortner to be a consistently strong author of historical fiction, and The Queen’s Vow is no exception. Isabella is taken from a semi-mythical queen figure to a real, human person with her own strengths and weaknesses, but most important with incredible determination. Highly recommended. Source: Publisher for a Historical Fiction Virtual Tour. Reviews from the rest of the tour hosts can be found here. I felt the same. He really has a talent of humanizing historical figures and helping readers identify with them. It really does look like a great book. I just finished reading a great historical romance titled, “The Romanov Stone,” which takes place during the Russian Romanov era, by Robert C. Yeager, and am in desperate need for a new read. Thank you for recommending “The Queen’ Vow.” I will definitely check it out! I am reading this at the moment and once again really enjoying the way that CW brings his characters to life!